A lot of people are affected by psoriasis and go on to develop psoriasis fingernails. Psoriasis is an auto immune disease where the body produces too many skin cells. The extra cell build up on the skin form scaly, silvery white or red patches and sores. It can occur anywhere in the body depending on the type of psoriasis affecting the person. About half of the people suffering from psoriasis and around 80% of the people with psoriatic arthritis go on to develop nail psoriasis. Doctors still aren’t sure why some people’s nails get affected and others aren’t. In some rare cases, the nails are the only part of the body that shows any signs of psoriasis. In normal cases, people have symptoms all over the body. The nail plate is that hard surface that makes up the base of your nails. People with this form of psoriasis have nail plates that can lose cells. This then causes small pits to form on the toe nails or fingernails. Just hominy pits there are varies from one person to the next. Some people only have to deal with a single pit on each nail while others have dozens of them. The pits depth also varies from person to person. Sometimes, the nails completely separate from the nail bed, this is the skin under the hard nail plate. This separation is known as oncholysis. This then leaves an empty space under the nails. People with this type of psoriasis may first notice a yellow or white patch at the tips of the nails. The color eventually goes all the way to the cuticle. Bacteria can get into the spaces under the nails and cause infection which then turns the whole nail dark. In addition to the pitting, nail psoriasis also causes changes in the texture of the nails. 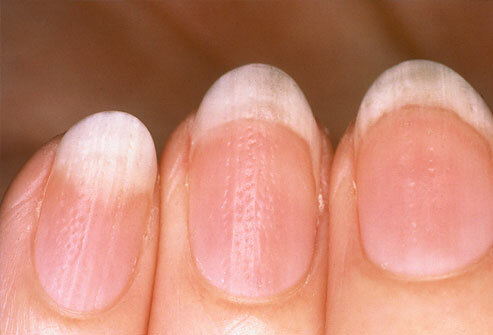 Psoriasis causes lines called “Beau lines” to form across the nails. Weakness in the structure that supports the nails may cause them to crumble. The nails can also become thicker due to a fungal infection known as onychomycosis, and this is common in people with psoriasis. The color of all or part of the nails may also change. You may see a yellow-red patch on the nail bed that looks like a drop of oil under the nail plate. This is where the name “oil drop spot” comes from. The toes nails and sometimes the fingernails too turn yellow-brown. The crumbling nails often turn white. While you can take some medicine to treat this form of psoriasis, take extra care to protect the nails while at home. If your nails become loose then begin separating from the nail bed, trim them very short so that they don’t catch on anything and rip off. Wear gloves whenever gardening or working to keep your nails from injury. It is quite challenging for people suffering from psoriasis as well as psoriasis fingernails. If you are among them then you must be wondering what s the best way to go about treating your nails. The good news is that there is a vast range of treatments available and most of them do a great job. Even though the conditions of the nails may not be as serious as other psoriasis symptoms, it can have a bad impact to someone’s standards of life. The nail beds may go through some serious damage leaving the victim in severe pain. In some cases, the nail splits off from the bed and comes off. This is why sufferers seek effective methods of treating this psoriasis form and some even go for natural treatments because of some of the side effects of modern medications. The most common form of treatment people go for is over-the counter creams for psoriasis. Opting for a cream that has vitamin D is great. These creams are readily available as well as bring relief to those who have the psoriasis. Its use is also easy as all you have to do is massage it onto the nail beds two or three times each day. Another way sufferers can get some relief is by soaking their nails in warm water. Let the nails stay in the warm water for about half an hour, this softens them up as well as the nail beds and the skin nearby. Doing this also brings improvements to any kind of topical treatments you may be using on the nails. In order to effectively deal with psoriasis of the nails, there are some effective over the counter treatments like the use of coal tar bath oil. This is not only easy but also very effective. For this form of treatment, you will need a tub of warm water in which you will put in 3 full cap of coal tar oil. Once it’s ready, soak your damaged nail in it for about half an hour. After this, neat the nails then massage the moisturizer to all the nails. The last treatment for psoriasis fingernails and toes is called phototherapy. This is where ultraviolet rays are used in treatment. The ultraviolet lights reduce the extraordinary speed at which the skin cells reproduce and thus improve the condition. This form of treatment is expensive but it’s one of the best treatments out there. For the best results, one has to attend several sessions. There are many other treatments which are also quite popular and effective that sufferers use and are able to successfully treat themselves. Keep in mind that to be able to successfully treat psoriasis of the nail, you require effort, patience and tolerance. This means that the nails don’t get better immediately. Like all good things, it takes time so be patient and things will work out. There may be many forms of treatment but not all of them may work for you. To treat your nail psoriasis, find what works best for your situation and go with it. If the symptoms don’t improve try something else until you find something that works.